DALLAS—Botham Shem Jean could not have imaged that his last night on earth would be a Thursday night in the comfort of his own home in the Cedars neighborhood—where people walk dogs, enjoy nearby restaurants, and view the latest films at a new cinema. He certainly could not have guessed his life would be taken by a Dallas police officer, who had no business in his home. Her gunfire should have been reserved for protecting and serving, and keeping a neighborhood safe from rogue criminals. the mother of Botham Jean who was shot and killed by Dallas police officer Amber Guyger in his apartment on Sept. 7, stands with Botham’s brother Brandt, second from left, and sister, Allisa Charles-Findley, along with attorneys Benjamin Crump, second from right, and Lee Merritt, right, during a news conference, Sept. 10, in Dallas to give comments about the officer that was arrested. Botham, a native of the Caribbean nation of St. Lucia, was no such person. The 26-year-old professional worked at PricewaterhouseCooper. A religious man of God, he would often lead songs with joy at his church. He mentored young people. Why did he lay in a pool of blood and why did a 30-year-old White police officer, Amber Guyger, kill him? Her claims and the official account are as bizarre as the death is tragic. Police say Off. Guyger worked a 15-hour shift, got off duty and returned to the Southside Flats apartments in the Cedars neighborhood. She lived on the floor below Botham. Still in uniform, she went to the door of his apartment, on the wrong floor, and with its distinctive red door mat. She claims she mistook Botham’s apartment for her own Sept. 6, entered, and shot the Black male inside in the chest. He later died at a nearby hospital. 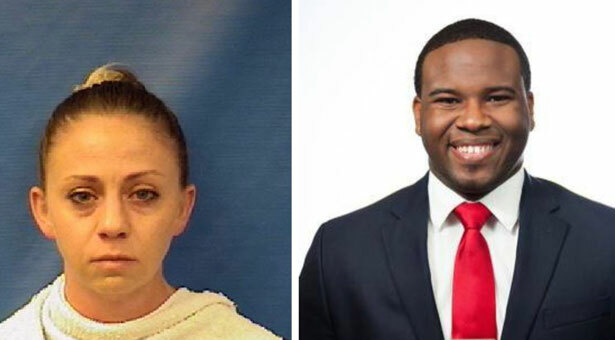 Dallas police officer Amber Guyger, charged in fatal shooting of unarmed neighbor Botham Shem Jean. Police say Off. Guyger worked a 15- hour shift, got off duty and returned to the Southside Flats apartments in the Cedars neighborhood. She lived on the floor below Botham. Still in uniform, she went to the door of his apartment, on the wrong floor, and with its distinctive red door mat. She claims she mistook Botham’s apartment for her own Sept. 6, entered, and shot the Black male inside in the chest. He later died at a nearby hospital. Community activists, members of the press, and others are already raising questions about a possible police cover-up. The changing narratives about what happened that night and unanswered simple questions from the family and their attorneys are causing concern. “What happened that night?” is the question posed over and over again to Dallas District Attorney Faith Johnson, a Black woman and a Republican. The earliest reports, on Friday morning Sept. 7, said Off. Guyger put her key in the door of the wrong apartment on the wrong floor and it did not work. Botham answered, saw the uniformed officer, and moments later he was shot dead, police said. The story has changed: Now the media is parroting the official police account that Off. Guyger entered the apartment with the wrong key, with the door unlocked. She saw Botham in the shadows and opened fire, thinking he was a burglar. Despite online rumors, Botham’s family and different investigating agencies say Off. Guyger did not know him. Blood was taken from the officer to ascertain if she was impaired due to controlled substances or alcohol at the time of the shooting. Test results have not been released. “The way Botham was killed is astonishing to most sensible people not only in America but around the world, since Botham was from the island of St. Lucia. It is now an international incident, with the world watching to see if his family will receive justice like the officer would have if the situation was reversed. Black people in America have been killed by police in some of the most unbelievable manners,” said Benjamin L. Crump, one of the Jean family attorneys and a leading lawyer in cases where Blacks have been shot and killed by police officers or gun-toting Whites. He was brought to public notice for his handling of cases like the 2012 shooting of teens Trayvon Martin in Florida and Mike Brown, in 2014, in Ferguson, Mo. Dallas-based lawyer S. Lee Merritt represents the Jean family as well. Every time the family has visited the district attorney, they leave with the simplest questions unanswered, he said. As she addressed the press Sept. 7, Dallas Police Chief U. Renee Hall described the killing as “a very unique situation” that had more questions than answers. Chief Hall, in that same press conference, initially declared that a warrant for the charge of manslaughter was in the works. She added that the investigation of the shooting had been handed over to the Texas Rangers in an effort at transparency, and to have an independent entity examine the case. 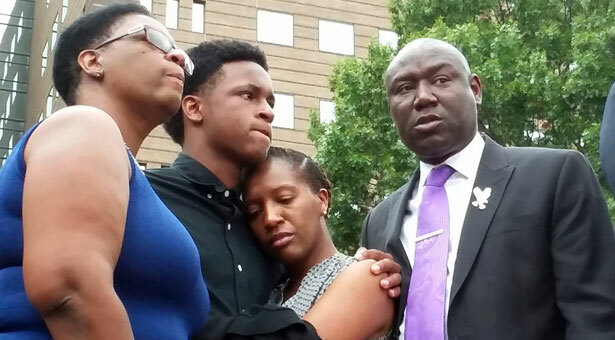 Allison Jean, left, the mother of Botham Jean who was shot and killed by Dallas police officer Amber Guyger in his apartment on Sept. 7, stands with Botham’s brother Brandt, second from left, and sister, Allisa Charles-Findley, along with attorneys Benjamin Crump, second from right, and Lee Merritt, right, during a news conference, Sept. 10, in Dallas to give comments about the officer that was arrested. The Texas Rangers have jurisdiction throughout the state to investigate potential crimes and police shootings. After interviewing Off. Guyer, the Rangers, with the cooperation of the district attorney’s office, decided not to issue an arrest warrant, according to the police chief, who is a Black woman. No arrest was made. Off. Guyger was free until Sunday evening, Sept. 9, when she was arrested and charged with manslaughter. She was released on $300,000 bond. Many in the Black community here, others throughout Dallas, across the United States, and on the island of St. Lucia, aren’t happy. People say they are angry over the lack of answers and three days of preferential treatment given to Off. Guyger. Botham came to America and graduated from Harding University in 2016. “You or I would be arrested if we went to the wrong apartment and blew a hole through a person’s chest killing them,” said Atty. Crump. Allison Jean, Botham’s mother and her family, arrived in Dallas over the Sept. 7 weekend. She spoke of her son’s love for humanity at a Sunday church service. “He was my pride and my joy. There are times you feel like giving up, I could not give up because of Botham,” said his grieving mother. Atty. Merritt has been vocal, calling out a double standard that favors police officers. They do not get charged when committing crimes any regular citizen would be prosecuted for, he noted. Off. Guyger, though off-duty, was in uniform when she killed Botham. “If there is probable cause that a crime has been committed in this jurisdiction, it is incumbent upon the district attorney’s office to issue an arrest for the officer involved,” said Atty. Merritt. The family was angry no immediate arrest happened, appearing to show a double standard in the favor of law enforcement, without anyone providing an explanation, Atty. Merritt added. Botham’s senseless death is another tragic killing of an unarmed Black man at the hands of those sworn to serve and protect the public, he said. Blacks in Dallas are growing tired of gross injustice, police violence and plan to organize for justice, said activists. Days before Botham’s killing, Roy Oliver, a former police officer from the Dallas suburb of Balch Springs, Texas, was convicted of murdering 15-year-old Jordan Edwards. Now Dallas again watches events unfold after a White officer killed an unarmed Black man, who was an upstanding citizen. “The official version of events in the shooting death of Botham Jean is all over the map,” said Sara Mokuria, co-founder of MAPB, whose father, Tesfaie Mokuria, was killed by Dallas officers in 1993. “The, ‘I-was-in-the-wrong apartment’ version lacks all credibility. And the mayor’s ‘let’s-all-come-together-moment’ is so tone deaf and false that it can only be taken as a cynical attempt to spin a murder,” she said. “Suppose it was the other way around, and Mr. Jean had fatally shot Guyger after ‘mistakenly’ entering her apartment. Do you think for a minute he would have been granted bail, sent home on paid leave?” asked Ms. Flanagan. Alshaheed Muhammad, Dallas Representative of Nation of Islam, said the killing of Blacks in Texas is nothing new. “The Honorable Minister Farrakhan has told us over and over again that the civility of this civilization is being peeled back like an onion. In the upcoming weeks, the world will see exactly what we’re dealing with in Dallas, Texas. I believe Almighty God Allah is showing us that separation is our only solution and the most intelligent option to our situation,” he said. The Texas Rangers and the district attorney’s office are still investigating the case. Their findings will be presented to a grand jury, which will decide whether Off. Guyger faces a trial. Dallas County District Attorney Johnson reminded the press Sept. 9 that the grand jury could indict Off. Guyger, or not—or the grand jury could indict her on a charge other than manslaughter. The Jeans are a well-respected family on the island of St. Lucia. Prime Minister Allan Chastanet came to be with the family in Dallas. “Allison did an incredible job of raising her son. We all in St. Lucia are extremely proud of Botham and what he represented and how he represented St. Lucia,” said the prime minister. “As I look as his (Botham’s) younger brother Brandt, I think, ‘what will the next generation of people of color’s interaction be with law enforcement and will it end with deadly force?’ ” said Atty. Crump. Why didn’t Off. Guyger use her training as a police officer, why did she use deadly force? the attorney asked. “It made no sense when we first got the news, and it does not make sense today,” he said.